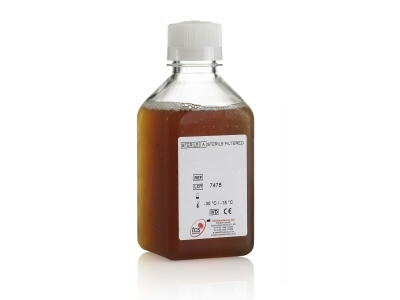 Newborn Calf Serum - TCS Biosciences Ltd. Newborn Calf Serum (NBCS) is suitable for use in many applications including cell culture by promoting cell lines and primary cultures. Suitability testing is the most reliable method of determining that a batch is suitable for use in its intended application. TCS Biosciences Ltd is pleased to offer a reserve service allowing customers to test smaller volumes of NBCS that are representative of larger bulk batches. We are happy to hold reserves on a call off basis. Contact our customer services department for more information. We offer New Zealand, Australian and USA origins of NBCS in 100ml and 500ml volumes. As well as the standard sterile filtered product we can also offer heat inactivated products. Blood is collected form healthy calves that are no more than 20 days old, and defibrinated and centrifuged under controlled conditions to produce raw serum in the country of origin. The serum is sterile filtered through a series of filters, with a final filter pore size of 0.2 micrometres. A certificate of analysis is provided with each batch of NBCS.